Away from the usual Barcelona tourist route, Sagrada Família – Casa Batlló – La Pedrera – Park Güell, there are other delights to discover in the colourful and elegant Modernism of this city. Discover other Catalonia secret places here. In the heart of the neighbourhood of Gràcia, a jewel of Modernist architecture, the Casa Vicens, is still unknown to many visitors to the city. This house opened its doors to the public in 2017 to reveal a hidden treasure of Gaudí – in fact his first masterpiece. Built between 1883 and 1885, and designed as a summer residence for the Vicens family, this building, which pays homage to nature, is not yet in the mainstream guide to Modernism in Barcelona – so take advantage of making a visit now. You may think that you “have done” La Boqueria or that it isn’t for you; however, this market in Modernist architecture, which opened in 1840 while having roots as an open-air market as far back as 1270, always offers new delights if you are willing to explore. Lose yourself in its labyrinth of colours – a feast for Instagrammers – and be inspired by choice of gastronomy on offer. While you’ll here, take a 'capipota' at Pinotxo Bar served by its local celebrity Joan. Away from the busy Sagrada Família, discover the avenue of Avinguda Gaudí, which ends on the majestic modernist construction by architect Lluís Domènech i Montaner, the modernist enclosure of Sant Pau. Formerly the Hospital de la Santa Creu and Sant Pau, this historical monument has become a centre of innovation. 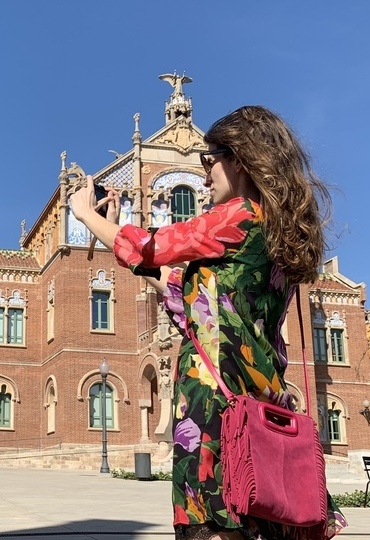 A building of red brick, accompanied by stone sculptures, walls of colour and ceramic mosaics, has helped established this piece of Barcelona as a UNESCO World Heritage Site.